Impress your guests with the sleek Stansport Stainless Steel 2 Burner Stove with Stand! The 2 30,000 BTU burners with rotary flame allow you to cook all your favorite gourmet dishes while outdoors. Cook up stews, seafood, meats, and more to satisfy a hungry crowd at your next backyard party or camping trip. The classy stainless steel burners and cooktop and durable stand will last for many seasons of use. The powerful burners fire up easily with the electronic matchless ignition. Show off your master cooking skills with the Stansport Stainless Steel 2 Burner Stove with Stand! 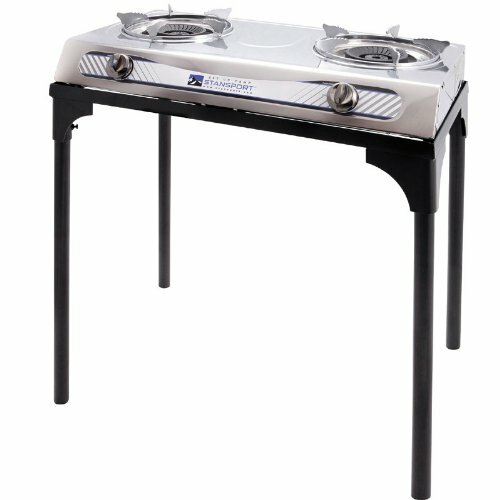 Hose and regulator included Two burner gourmet stainless steel tailgate stove/stand combo set. Two 30 -000 B.T.U. high efficiency cast burners with rotary flame for even cooking. Stainless steel body with removable drip rings. Matchless electronic ignition. Comes with heavy duty table stand.